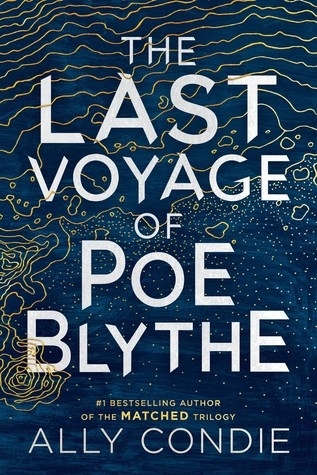 THE LAST VOYAGE OF POE BLYTHE is a fascinating YA fantasy/dystopian that is even better than Condie's Matched series. The book begins two years back when Poe is on a dredge voyage, working on a ship that mines the rivers for gold. She is madly in love with Call, the only person she has, and together, they count the stars and the time until they can escape. Both grew up in the orphanages of the Outpost, where work is hard and death is well-known. Raiders, people who live outside the Outpost, frequently attack the dredges to take the gold. Call is on watch when they attack and he is killed but Poe and the others are spared. When Poe gets back to the Outpost, she has decided that she will kill all the raiders and has invented weapons to do so. Now, two years later, her weapons have killed more raiders than they ever would have imagined. Poe lives alone, in solitude, and she is happy this way. The Admiral, who rules the Outpost ruthlessly, tolerates her because of her inventions. He has now decided that she must go on the dredge for a big mission to mine a lot of gold and protect her inventions. She leverages this into being captain so that she can continue to live alone. As Captain Blythe embarks on this mission, traitors will rise, friendships will be questioned, and everything Poe thinks she knows will be called into question. Poe is an easy character to like and understand- she is perfect as the lead of this book. We gather bits and pieces about this world through revelations here and there. While it would be interesting to know the history leading to the present, the world-building was adequate, and we get a good feel for what Poe's world looks like. With prose that is lyrical at times, we follow this fascinating journey of discovery and question the value of revenge and human life. I was completely caught up in this fascinating book, and I found it difficult to put down. There are also tidbits of romance that I am curious to see how they will develop in the future (I am assuming there will be more in this series). This book was rather dark at times with ample death and destruction. With interesting insights into politics, how politicians make decisions, and the thirst for revenge, this book is absolutely engaging. I highly recommend for fans of YA dystopians. Spotlight on The Infographic Guide To College, Plus Review, Video & Giveaway! Blog Tour: The Smoke Thieves by Sally Green, Plus Excerpt & Giveaway!